Let me tell you about my visits with my grandma. Actually, let me back up even before that and tell you about my grandpa (other side of the family). He was an amazing man with whom I spent many of my childhood days. He taught me how to make popcorn on the stove and to always put others first. He passed away about a year and a half ago. And in the couple of years before his passing, I had this deep desire to know his stories, to soak up all of his life that I could. But his hands were too shaky to write me back, and it was too hard to hear me over the phone. He was tired. I missed it. I missed my chance at hearing his stories. I know many of them will be preserved through my mom and uncles. But I’m still sad that I missed hearing them from him. I miss him. Back to Grandma. My life-living, card-playing, cursing, traveling, gambling, very very loving grandma. I adore her. I head up with my kids once a season to visit, have lunch, and – if I’m lucky – look at pictures. I want to hear her stories, too. But she’s so rockin and young, it felt weird to just straight up ask her for stories. I was worried she would be on to me, and it might make her feel old. I never want my grandma to feel old. She isn’t. At all. And then one day it dawned on me: I could ask to look at her albums. And the stories poured forth… She laughed, she got tears in her eyes, she told great stories. I laughed, got tears in my eyes, and became closer with my grandma. WHAT a gift. I am the luckiest. No matter the money situation in our family all through the generations (and it was usually relatively grim), pictures were always valued. These posed ones – Sears or Olan Mills that everyone dressed up for, and the every day snapshots: treasured. It’s the way we pass on our stories. My love for pictures started when I was very young. 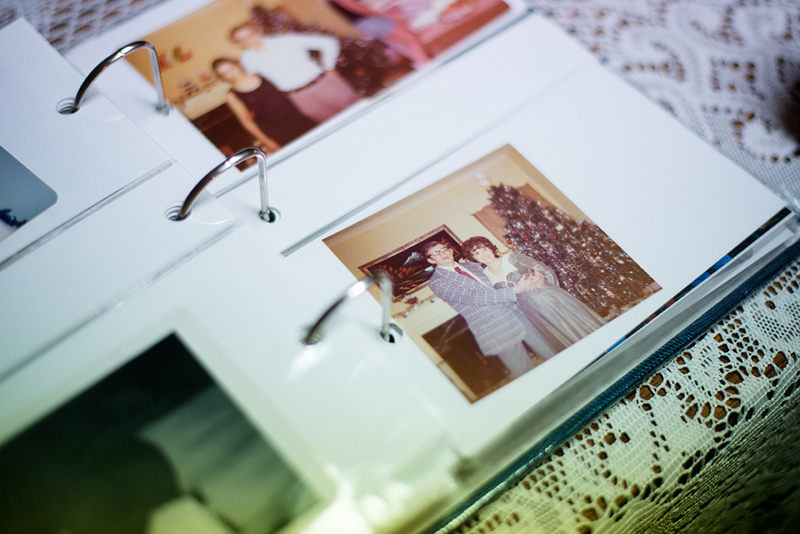 I remember fighting with my mom about wanting to look through the boxes and piles of pictures under her bed (I wasn’t allowed because eventually she was going to get those into albums and she wanted to keep them in order – understandable). This love of pictures and the stories behind them is eventually what led to my love of photography. And it’s also what leads me to the way that I run my business. I often get asked: “So why not hand over just the digital files? It’s what everyone wants these days, and it will make you even more money since you won’t have to worry about product cost or design time.” And maybe you’ve already guessed my answer by this point. This: This is why. Not my dad when he was a kid up on stage with his band (although that’s pretty rad). 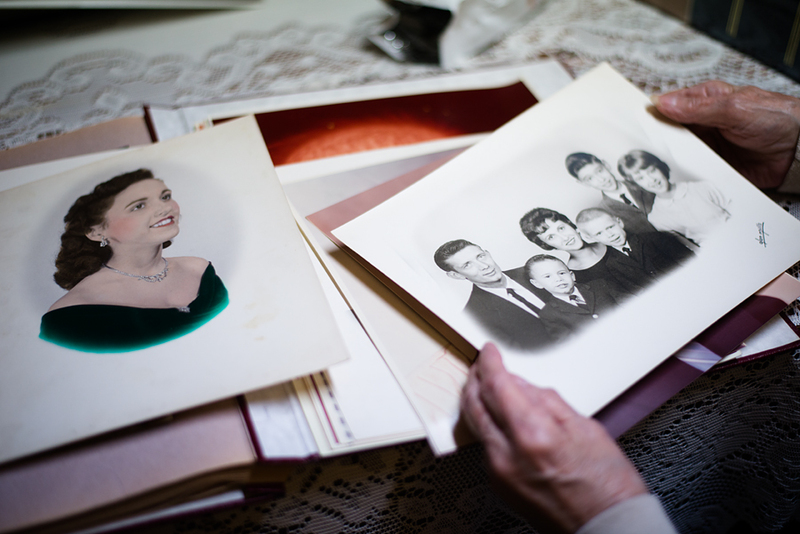 But there is just nothing like going through an album with your grandma. Or with your kids. I want anyone who comes to me to preserve their memories, to have something more than digital. I want them to have something tangible, something to look through and remember. I want them to be able to show these pictures to their grandkids someday, and to be able to pass them on. Don’t get me wrong, I dig this digital age. It’s awesome to be able to back up pictures (and I do offer digital rights). Facebook is an amazing thing – I love getting to see images of my family and friends who are far away. I like that I can have this little window into their lives even if we may not get to visit in person very often. But way more important to me are the images I can touch. The ones that are up on my walls, that we see every day. The ones that are in albums that I page through with my kids. The ones that hold the memories of the people I love the most. 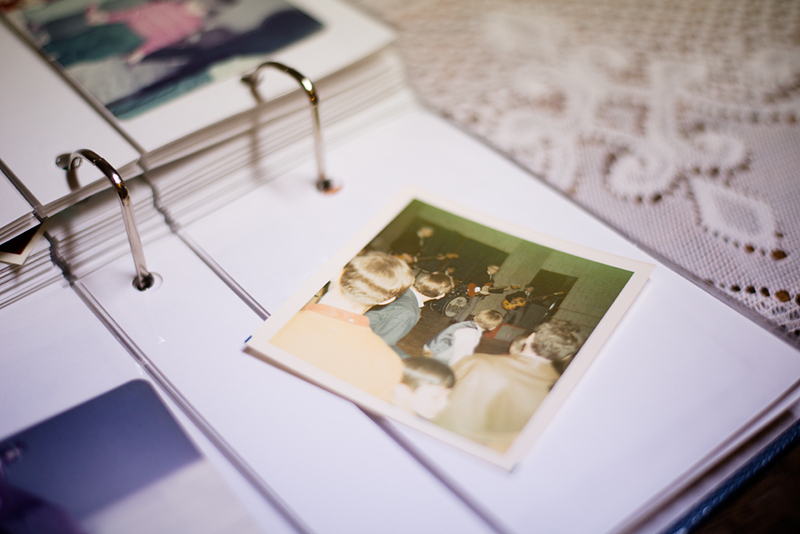 There is nothing like flipping through an album and hearing the stories behind the pictures. It may be old school, but I love it. This entry was posted in documentary, my family, personal and tagged albums, columbus ohio family photographer, columbus ohio photographer, digital dark ages, family, grandma, passing pictures down through generations, photo, Photography. Bookmark the permalink. Beautiful story! I had it reversed and missed my grandmother’s stories where I’m now visiting Gramps and soaking up all his. I’m old school as well, loving tangible things like books and printed photos over a tablet. Great photos,great post! i’m sorry you missed your grandmother’s stories! but i am happy to hear you are hearing your gramps’s. grandparents are really cool, huh? Love this. This is so perfect.